Temperature of air and soil are the overarching factors of growth and development of above ground and root systems of fruit trees. All of this needs to be considered when evaluating overall heath of the tree and before we start any tree surgery. Atmospheric temperature affects the chemical processes and movement of substances inside the plant, such as evaporation of water from leaves microbiological processes in the soil and so on. Not only a frost-free period of a certain duration, but also an appropriate temperature changing rhythm over the whole year are essential for the right development of plants. Consequently, gradual cooling during the fall time allows the trees to prepare for winter dormancy. Initially, at a temperature from 0° to 6° C, in plant organs large carbohydrates (e.g. starch) are transubstantiate to simple ones (e.g. sugar). Then, at a temperature from 0° to -12° C, when water passes from the cells to the inter-cellular spaces, a reserve of organic matter “for tough times” is forming. After that, the plant settles down into dormancy state. You should note that the deeper the plant’s state of relative calm, the higher its hardiness. By the way, it is necessary to distinguish between these agronomic terms, as the frost tolerance and winter hardiness. You should keep all this information in mind selecting cultivars of fruit trees for the garden. Frost tolerance is a peculiarity of a plant to adapt to the impact of low temperatures in a proper way. 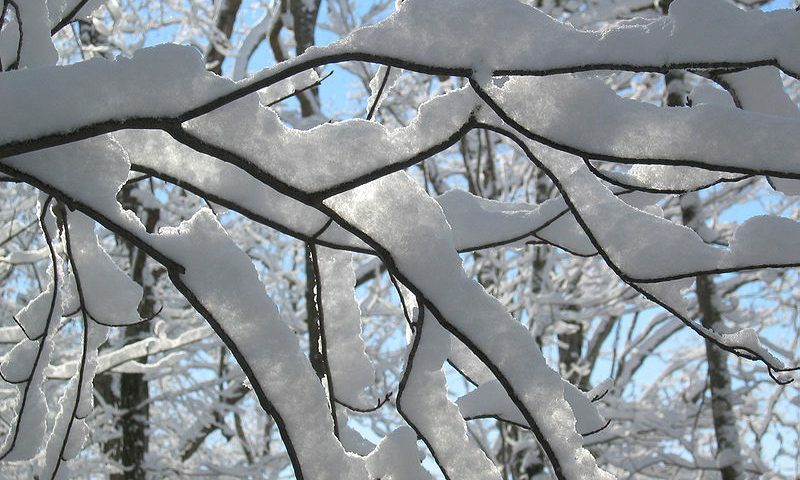 Winter hardiness is an ability of plants to withstand the whole range of different winter conditions: a certain moisture level of soil, strength of wind etc. (Experts specified that cold-hardy cultivars of fruit trees are settling down into dormancy state much deeper than others.). We recommend to pomiculturists to keep a diary of observations – to record all the change bits in fruit and berry plants life, as well as the terms and the nature of gardening. Inclement winters, if not destroying fruit plants, but shortening its lives. But more often buds and branches are suffering from frost. Notably that it predominantly happens if the plants hadn’t been prepared for the winter in a proper way. For example, fruit trees have plentifully fructified and haven’t managed to save up enough spare substances, or ensuing a summer-autumn drought season have prematurely dropped all the leaves, or its foliage has been damaged by pests and diseases. To keep out of it, your garden needs a competent tree surgeon care which is the only way plants can make it through the winter safely. The growth of fruit plants is mostly affected by the temperature during the spring, especially in the morning. The nutrient enrichment is mostly affected by the weather in mid-summer and autumn period. Moderate daytime temperatures are exerting salutary influence over the processes of photosynthesis (enrichment with organic matter). Conversely, high daytime temperatures (e.g. such as were documented during the summer of 2010) are aggravating the performance of the leaves and enrichment with organic matter. Hence You get a notable shortage of the crop. The fruits are ripening better on condition of the average temperatures in August and September are elevated. The most favorable conditions for the growth of wood if the average temperature in late fall is lowered and in early winter it is close to 0°C. We can sort fruit plants by its particularity about heat to be arranged in such an order. North Zone: rowan – bird cherry – cherry crab – berry crops. Central area: apple – cherry – plum – pear. South Zone: cherry – quince – apricot – walnut – pecan – hazelnut – almonds – peach. Subtropical Zone: pistachio – chestnut – Eastern persimmon – figs – olive – feijoa – tangerine – orange – lemon – avocado. If You got a garden of young fruit trees, You should take especially reverent care for the trees as they need constant careful attention. Of course, if You put enough necessary efforts the harvest will not take long. Plants bed out during the last season may fail to strike root for various reasons. Besides, any shortcomings in bedding out frequently affect process of further rooting and growth of the trees. 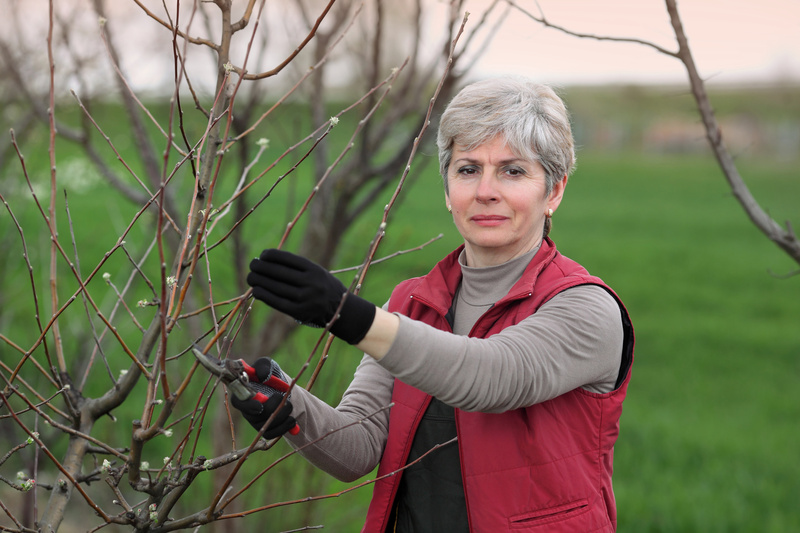 It’ll be much easier to rectify these deficiencies while your fruit trees are young. This could also be a great time to do any tree pruning at this stage. Firstly You should take up higher every too much sunken tree. For this purpose, You should dig a trench around the trunk at a distance of 35-40 cm from it with the same depth. Then two men carefully lift up the root ball with shovels, pouring under it the nourishing soil in order that the plant should be bed out at the correct level. Still You shouldn’t overdo it, as the root collar and the roots should not be bared. The lean of a tree is another imperfection coming from not properly puddled soil in the landing pit after bedding out the plant. The fix of the problem is simple, until the tree hasn’t grown too much. For adjusting lean tree it should be carefully pulled in the right direction via tying it to a firmly driven stake. To straighten crooked boles (trunks) or soboles a rail should be firmly tied to the bole at the sweep area. In the summer as far as the bole would be thickening to avoid constrictions the garter should be loosen. A sweep of the bole of young plants could be fully corrected for 1-2 vegetation season. On condition of proper growth by the end of the first year the roots of a fruit tree occupy the entire area of the landing pit and expand even little beyond it. Hereafter annual growth of the root system across the whole diameter could measure up to 50-80 cm. For this reason, in the second year after bedding out diameter of the circles around the boles of apple or pear trees are usually adjusted to 2 m. With the excrescence of the crown the around the boles should be increased annually. Throughout the spring and summer the soil around the boles should be loosen with rake to a depth of not more than 5 cm in order not to injure the delicate suction roots. While autumn leaf fall the soil in circles should be dug up with overturning of the furrow slices. 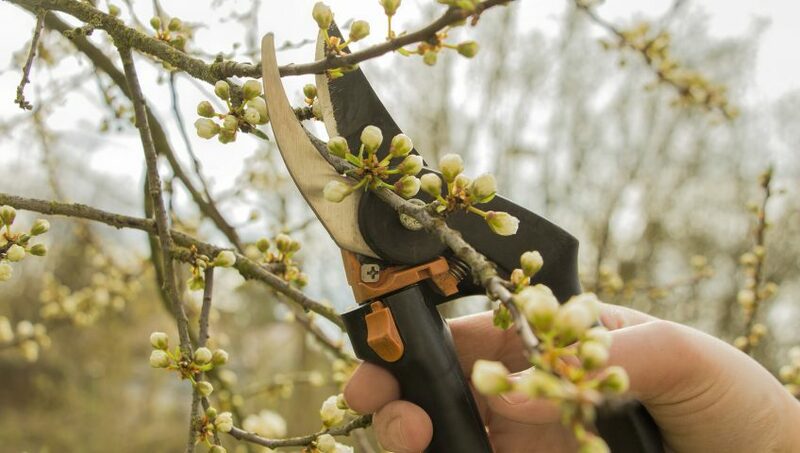 For pome fruit trees – to a depth of 15 cm, for stone fruit trees – up to 12 cm, without breaking the clods. Near the bole soil should be dug up shallow. Alongside with digging You should make a mulch of manure and peat. In spring the soil in circles around boles should be dug up, as early as possible, and no deeper than 6-8 cm, without overturning of the furrow slices. Then the soil should be well loosen, in order that there was no large clods. On the old, well-developed soils only loosening the soil in circles around boles restricted to a depth of 7-10 cm can be recommended. Digging the soil in circles around boles is highly recommended to perform with garden fork as it less damaging method for the tree roots. The soil in circles around boles needs to be weeded all the summertime long, in order it would not overgrown with weeds or lawn grass. To maintain moisture and good soil structure You should mulch it with peat or sifted compost in layers of about 5 cm. During active growth at the beginning of the summer the young fruit should be well watered. Depending on the amount of rainfall and the nature of the soil in the first half of the summer the trees should be watered from three to five times a day. In dry years, and at the south regions with a shortage of rain – up to seven – eight times or more. Watering should be abundant, to wet the soil to a depth of at least half a meter. The average rate of quantity of water per square meter of the soil in circles around boles compiles about 2-3 buckets. In the first year of bedding out for each watering of one plant 2-3 buckets of water should be diffused. Later on the watering rate should be increasing in the one-two buckets yearly. For a 5-6-year-old tree should be poured on average 7-8 buckets of water, and for a 8-10 year-old tree – 10-15 buckets of water. You should diffuse less water for the plants bedded out on light-textured soils, and on the contrary much more often for plants on heavy -textured soils. In some years in the central and northern areas due to the abundance of moisture in late summer the growth of trees delayed, the wood didn’t grow ripen and perished from light frosts. To protect fruit plants, You should stop watering them in August and only in October, with the beginning of leaf fall, when autumn is dry You should proceed with supplemental irrigation – three buckets per square meter, evenly distributing moisture on the soil in circles around boles. For more information on tree pruning have a look at this great resource.